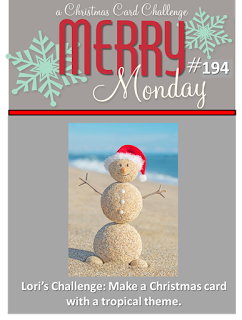 This week Lori challenges us to create a Christmas card with a tropical theme. When I think of tropical, I think flip flops. I saw these Santa Flip Flops online and knew I wanted to make some to use on my card. The dies I used are from Lil' Inker Designs. The sentiment is from Papertrey Ink. LOL, this is so cute & clever! I got lost when I saw the word "tropical"!!! This is soooooooo clever and soooooooo cute!!! Santa flip-flops...who'da thunk it? Love it! We are off to New Zealand tomorrow so will be MIA for almost 3 weeks. Will try to squeeze in a hello somewhere along the way - as long as we can find free WiFi! Outstandingly clever, Kristie!!! LOve this! Oh my goodness, could this card be any cuter?!!!! Those flip flops are the BEST! Those Santa flip flops are adorable. Lovely card Kristie. Hope you have a great week. So so cute & a clever take on the inspiration. I would love a pair of those Christmas flip flops, Kristie! Sometimes I get to wear flip flops at Christmas! Have a wonderful week! Love your cute flip flops. Great card. Oh, this is so fun and so clever! I love it! This is so awesomely creative, Kristie! Such fun!!! Totally adorable festive flip-flops, Kristie - love this card!! Too cute, I love your creative tropical Santa sandals.